There are actors who delight us because of their ability to disappear into the skins of characters, and actors who delight us with the relish they take in creating broad-stroke caricatures of human (or even semi-human) behavior. On the one hand, Meryl Streep. On the other, Christopher Walken. At 43, with nearly three dozen films to his credit, Johnny Depp is one of a small handful of actors who can do both: dazzle us with perverse displays of witty grotesquerie or inhabit a character so completely that we can't remember what he's really like—or seems really to be like—off screen. Depp emerged more than 20 years ago as one of the youngest of a generation of fine, adventurous actors (including Sean Penn, Nicolas Cage, Tim Robbins, Kevin Bacon and John Cusack), and he has remained a playful, probing, impish presence in movies even as he has become the center of blockbuster films. 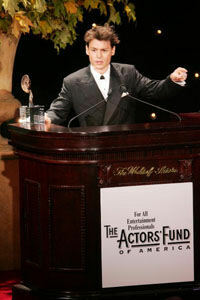 He has steadily balanced a career playing such over-the-top characters as Ed Wood, Edward Scissorhands and Captain Jack Sparrow (the delicious role he created in 2003 and reprises in Pirates of the Caribbean: Dead Man's Chest) with serious, probing performances in films like Donnie Brasco, What's Eating Gilbert Grape, Finding Neverland and Blow. He has forged an old-fashioned collaborative enterprise with a single director, Tim Burton, with whom he has made four live-action films and one animated feature. In this varied career, Depp has become a truly singular presence in film, subtly weaving classic acting styles to create a performance technique all his own. In Depp we can see at once the physical presence within the filmed frame typical of silent movie stars, the easy command of screen icons of the Golden Age of Hollywood, the brooding depth and commitment to realism typical of Method Acting, and the try-anything spirit of European movies of the '60s and American independent film of more recent vintage. Other of his contemporaries have similar range, but Depp seems more cinematic than any of them; you can imagine Penn or Cage or Bacon, for instance, having a career solely on stage. Depp, on the contrary, feels at once a pure product of the screen and a summation of the types of acting it has inspired. You couldn't have predicted that Depp would turn out such a singular combination of Charles Chaplin, Cary Grant, Marlon Brando and Alain Delon. He began inauspiciously, after all, as one of Freddy Krueger's first-ever victims in the original A Nightmare on Elm Street and followed that with a starring role on the teen crime show 21 Jump Street. That sort of resume might have yielded another Luke Perry. But in the early '90s, Depp gave several eye-opening performances that unveiled the antic, experimental spirit inside him. In John Waters' 1990 Cry-Baby, Depp brazenly mocked his teen idol persona; later that same year in Edward Scissorhands, his first film with Burton, he revealed a startling ability to express himself using only his body and eyes. The first role was a put-on, clearly. But as the nearly mute, fancifully constructed, painfully lonesome Scissorhands, Depp was a revelation, giving flesh, bone and muscle to a fantasy that might've crashed had any other actor tried to steer it. He fully embodied something you would only dare imagine; you could imagine Chaplin or Walt Disney reveling in the performance. In 1993's Benny & Joon, in fact, Depp specifically invoked Chaplin. 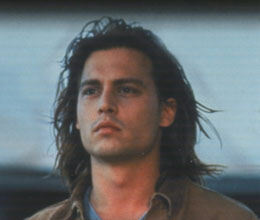 But if he had given the impression that he would be happy to keep playing whimsical goofballs, he scuttled it with What's Eating Gilbert Grape, in which he gave a sober and measured performance as a young man on just the safe side of deeply troubled. There was little flash in the role (Leonardo DiCaprio, as his mentally challenged younger brother, stole the show), but Depp gave it real solidity. It was consciously grown-up work. From there—and right up to today—Depp has careered wildly between the extremes of subtlety and mania. Take the string of work he delivered in the mid-'90s: Don Juan DeMarco, in which he played a hammy neurotic being cared for by the great Marlon Brando himself; Dead Man, an existential, black-and-white anti-Western by Jim Jarmusch; Donnie Brasco, in which he wholly absorbed himself in the guise of an FBI agent working undercover in the Mafia; and Fear and Loathing in Las Vegas, in which he played Hunter S. Thompson's alter ego in a garish fantasy directed by one of the few directors more outre than Burton, Terry Gilliam. Bracketing that fascinating quartet were two films with Burton: 1994's Ed Wood, in which Depp's giddy laughter jarred mischievously with the pathological oddness of his role, and 1999's Sleepy Hollow, in which Depp invested his Ichabod Crane with a creepy combination of bloodthirst and cowardice. By that point, it was clear that there were at least two Depps: the Depp of the Burton movies and the comedies, all tics and tricks and accents and disfiguring makeup and twitchy giggles and gangly limbs; and the Depp who could occasionally vanish wholly into a character of weight and pathos, using the same tools as the trickster Depp but to a different and often profound end. In recent years—in the years, crucially, since Depp became a father—this latter has been a more common persona. As a dashingly romantic leading man in Chocolat, an ambitious cocaine dealer in Blow, a clairvoyant detective in From Hell, a self-loathing roue in The Libertine and the fanciful but wounded J.M. Barrie in Finding Neverland, Depp has essayed an impressive variety of what you'd have to consider serious roles. You could argue that no actor his age has been so intrepid and so good during the same period. 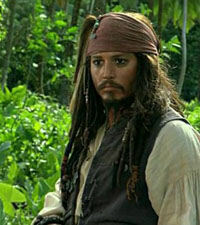 But that work has been overshadowed by two big summer movies that have given Depp a superstardom he almost didn't seek. Playing the eccentric candymaker Willie Wonka in Burton's 2005 Charlie and the Chocolate Factory, Depp created another of his merry, tortured eccentrics, a man part pixie, part fascist, part ferret and part frightened boy. And as Captain Jack Sparrow in the 2003 blockbuster Pirates of the Caribbean: The Curse of the Black Pearl, he was an outright sensation, combining W.C. Fields, Keith Richards and Buster Keaton with enough makeup and frowsy clothing to outfit a brothel. Woozy and cunning and dainty and decadent, Jack Sparrow has become a signature role: A third Pirates is due in a year, and Depp has declared he can imagine doing the role as many times again. Notably, Depp has achieved this great commercial success without abandoning his taste for risk and for surfing the margins. Nic Cage, in comparison, has made plenty of blockbusters, but he has generally ratcheted down his idiosyncrasies in them in a kind of pact with the bland devils of the business. Depp, arguably, is playing even more outside the lines than ever as Jack Sparrow, and yet he is being embraced for his cheek in a classic instance of an audience catching up to a performer. He's come a long way from Elm Street and Jump Street, and he has sometimes traveled so far from the middle of the road that you needed a spyglass to find him. But doggedly obeying the call of his own muse, Depp has taught us to see and measure him as he, in his own singular fashion, does himself. He's going to get more interesting as his middle years approach, you'd have to bet. He may even have some more versions of himself up his puffy sleeve.